Things are not great for the midsize sedan segment, and by extension the automakers who have put resources into building them. Trucks, SUVs and crossovers dominate sales these days and companies with sedan-heavy lineups, like BMW for example, are feeling the sting. This is even more true in the non-luxury segment where buyers are saying “Screw it” and opting out of Camrys and Accords for slightly bigger, roomier, taller vehicles like the RAV4 and CR-V. Can the sedan segment be saved? 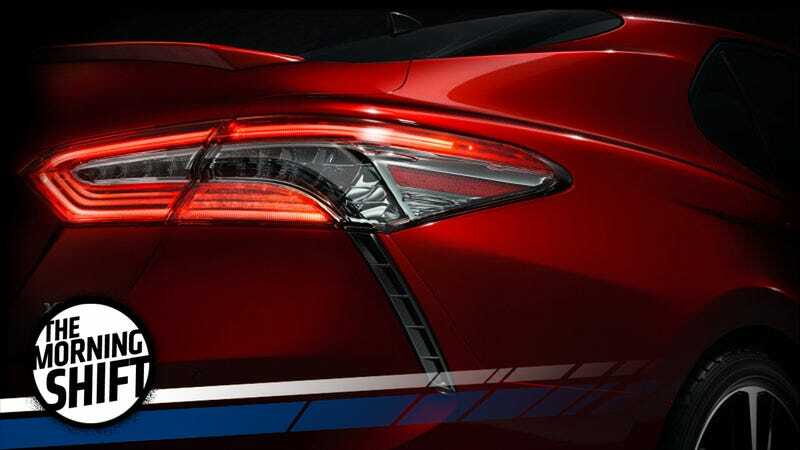 At a Thursday reception in Detroit, Toyota executives revealed the plan to show a revamped Camry at the city’s North American International Auto Show in January. The automaker’s new model likely will have some company: Nissan Motor Co., Honda Motor Co. and Hyundai Motor Co. will all be unveiling updated designs for their core midsize sedans at the show, according to the trade journal Automotive News. “Who knows, bring some growth back,” Carter said with supreme and utter confidence, before hosing his mouth down with silver spray paint and jumping onto an exploding Volkswagen Beetle-turned-big rig. The discounts were more generous on remaining 2016 car and truck models. GM dangled incentives that topped $10,000 on some Chevrolet Silverado pickups and Suburban SUV models. Some Hyundai dealers cut prices on 2016 car models by 21 percent to nearly 40 percent, and offered a $100 Visa reward card with the purchase of a new model as part of Black Friday deals. What’s more, November left the industry in a better position to top last year’s 17.47 million tally. Sales through October were 0.3 percent behind their year-earlier pace after three straight monthly declines. With November in the books, industry sales are running just 6,418 ahead of 2015's pace. If the industry manages to eke out an annual gain, 2016 would mark the first time in a century that U.S. sales topped year-earlier levels for seven straight years. Sales rose every year in a nine-year stretch through 1917. Analysts now expect sales to close at 17.83 million new cars this year. We’ll see how December shakes out. At an event that was to have focused on touting the Mexican industry’s bright future, the executives were peppered with questions about how a Trump presidency might jeopardize their plans. They insisted that the starting point in any negotiation should be that economic integration in the auto sector has been good for all three nations in the trading bloc. Solis said that he hadn’t heard of any plans by automakers to cut their Mexican investment plans as a result of Trump’s election. He noted that Toyota broke ground on a $1 billion Corolla plant in central Mexico just days after the election. Automakers from across the globe continue full steam with investments there. Trump’s target as of late has been Indiana-based air conditioning manufacturer Carrier, and he boasts of arranging a tax incentive deal that will keep half of those jobs from going to Mexico. But the author of “The Art of the Deal” will have a lot more dealmaking to do if he wants to stop the steady erosion of manufacturing jobs from the country due to automation and lower costs abroad. In Indiana alone, employers are eliminating at least 3,660 jobs because they are shifting work to other countries, according to a Reuters analysis of Labor Department filings. Some 960 workers employed by five companies in Indiana are losing their jobs because their U.S. employers are not able to compete with cheaper imported goods, filings show. [...] As elsewhere in the United States, factory work in Indiana has lagged as the broader economy has recovered from the 2008-2009 recession. Manufacturing employment is down 7.4 percent from January 2007 levels even as total employment in the state has risen 3 percent since then, according to the U.S. Bureau of Labor Statistics. Nationwide, manufacturing employment is down 12.5 percent since 2007, according to the bureau. We will see if the new president and his administration plan on directly intervening with more automakers considering production shifts outside the U.S. With Ford and Lincoln we’ve already seen that, even though the claims made by Trump were dubious at best. Most of the nearly 1,700 hourly workers remaining at the plant following a shift elimination in July are on temporary layoffs – or will be – as the company retools to build the next-generation Ram 1500. The retooling is expected to take much of 2017. Fiat Chrysler earlier this year told state officials it will add 700 new jobs when production of the pickup begins at the plant. The additional jobs are part of the company’s plans to invest $1.48 billion in Sterling Heights Assembly plant to produce the pickup as well as enhancements, including a paint shop renovation and test track. State officials, which granted the company millions of dollars in incentives, have said the company would have a base employment of 4,600 at Sterling Heights before the new hires. That would be a substantial increase from the nearly 1,900 employees, including salaried, at the plant as of July. With luck the shift to truck production will secure those jobs and the plant’s future better than the sedan ever could. Neutral: Does The Midsize Sedan Have A Future? Listen, the Camry and Accord probably do. People will be buying those long after humanity is extinct, somehow. Their sales are all but guaranteed. It’s the smaller players in the segment who should be really worried, and reassessing their investments in it.